Properties in Conway Dinner Theater average 4.6 out of 5 stars. 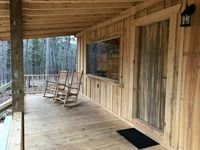 Property 5: Beautiful ridge top woodland getaway with warm friendly Southern charm. Property 6: New - CLEAN AND COMFY Conway TownHome! Property 8: NEW! 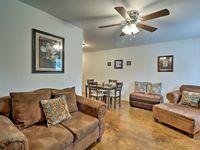 Cozy Apt- Walk to Downtown Conway/Near Lakes! Property 10: Home in quiet area, half a mile from Hendrix and 1 mile from downtown. King bed! Property 11: The College Station. Get a real taste of true Southern hospitality and natural woodland beauty. Property 14: Get a real taste of true Southern hospitality and natural woodland beauty. New construction, very clean and in a wooded area. The cabin was new construction and was very clean. We loved the porch looking out over the woods (especially because we did get a fair amount of rain and had 3 children to keep busy). The heater was a pellet stove and it did make a vibrating noise during the cool nights and although the cabin is listed as sleeping 6 two of the 6 were the sofa and a recliner chair which to us is not acceptable for an adult but because we had children they were happy to be on the floor in sleeping bags. We enjoyed the deer and the fire pit. We were travelling to baseball and played at various fields in Conway. The location was great in terms of being convenient to the fields and to various restaurants and stores. The neighborhood is on the run-down side. We spoke to some neighbors and they were friendly and helpful and we didn't encounter any problems at all. As far as the units themselves, we rented two of them and they were both exceptionally clean and everything appeared to be new or very well taken care of. We had everything we could possibly need, from a Kroger's card to a hair dryer. My kids loved having a TV in each of their rooms, and I loved having the washer and dryer so handy. I would stay here again.